2 by 3 Heroes: Oh, the vintage you'll get! Let's not waste time and get back to the rest of a trade box I received from Shane at Off The Wall. Yesterday I went through some of the highlights from recent cards back to the 90's. 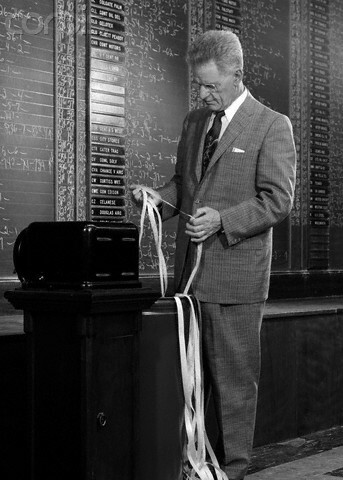 Today, we are going to go farther back in the calender. As is probably the case with a fair number of us, vintage cards are low in my collection. Everyone has their own interpretation of "vintage". For me, pre 80 is vintage. I haven't figured what to call the early and mid 80s until the junk wax. The leading name in the polls is really Kajagoogoo? 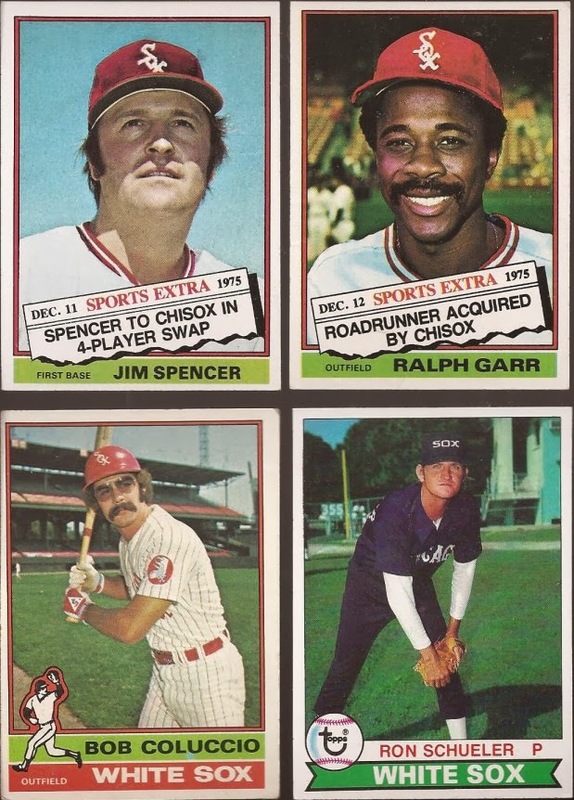 ...a nice 1977 Hostess of Rickie Zisk. Zisk is one of a few players to launch a home run onto the roof of old Comiskey. Here he is during his single year with the Sox. 141 games - not really a short term, Nick. Here's your standard bad shop jobs from the '76 Topps traded cards. Quite the radical change in uniforms with the jump from pinstripes to the old timey dark blues. 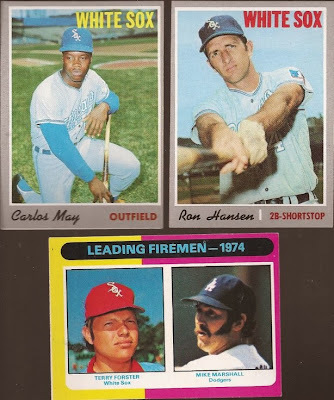 The 70's were also represented with a nice 75 Fireman card (Forster lead all of MLB with 24 saves in 1974). Shane also tossed in two 1970 Topps. I would love to see the blue uniforms used as throwbacks sometime soon. 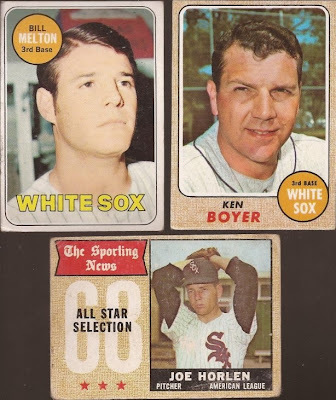 Late 60's showed up with an All Star of Horlen and a Boyer card from the 1968 set. 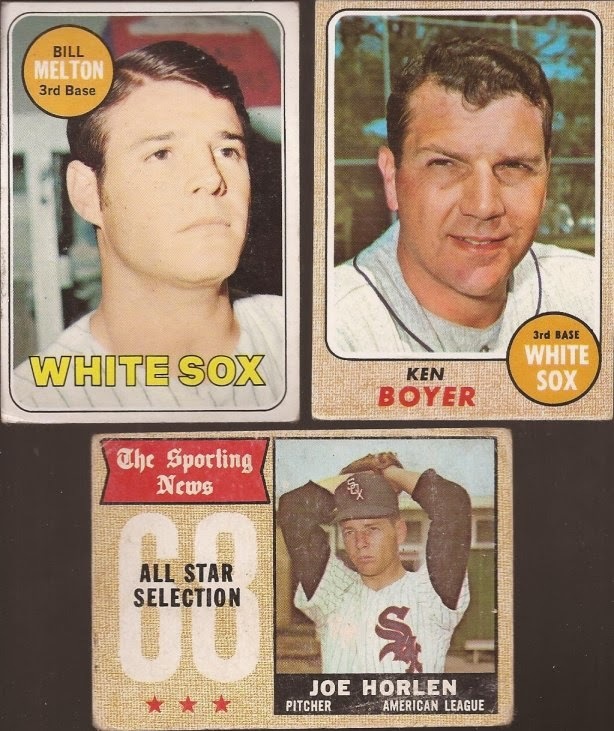 And the Beltin' Bill Melton from 1969 just happens to be his rookie card. I hated last year's Heritage. It didn't feel right when based against the original from 1963. I have more Sherm Lollar cards than I ever paid attention to - I should start a Lollar Project. This trio increases the number of 1963 cards in my collection to 4. 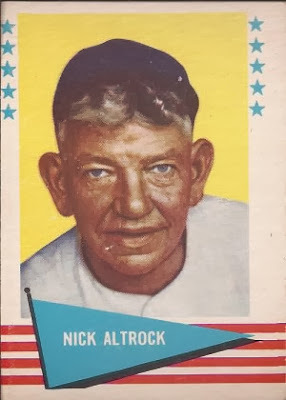 And we wrap up the vintage with this dang near pack fresh 1961 Fleer of Nick Altrock. I enjoy this set a lot, but this in the very first '61 Fleer I have added to my collection. Why is it when you enjoy a set, you desire it but don't actively pursue, until you get one? Then it suddenly becomes your main focus. Thanks a lot for adding another obsession to my life, Shane! As you know, last image is usually the best of the package. Guess what - I still have four cards to show off. Along with the already displayed greatness were four - yes, 4 - autograph cards. Kip Wells had a couple okay seasons, but he never panned out during his MLB journeyman career. Fordyce was supposed to be the catcher of the future for us, but never really lived up to his potential. Corwin was a career minor leaguer that never got the call up to the show. While that all sounds negative, the cards are anything but. It's nice to add three former White Sox to my autograph binder. And yeah - I said four autographs. The last card to showcase? Current manager (if he gets his act together next year), 6 time Gold Glover and 2 time All Star Robin Ventura. I had scored a Five Star auto of Robin many months ago, and love adding more of Ventura to my collection. You all should work out a trade with Shane. He still needs A&G minis from this year, so shoot him and email and make it happen - don't be shy. That's a nice collection of vintage. The Altrock especially. Very nice vintage. 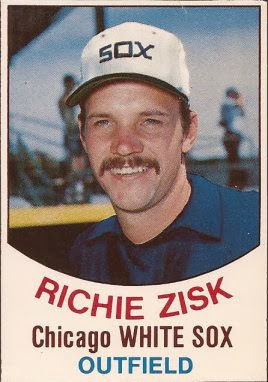 I don't think I knew Zisk had a Hostess card.